Going to a Card Swap Tonight! 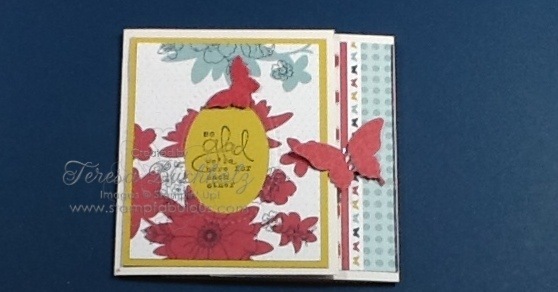 I am going to a card swap with some local Stampin’ Up demonstrators tonight. We haven’t gotten together in over 2 years, so I am hoping to be very inspired by their cards! Here is my card for tonight. 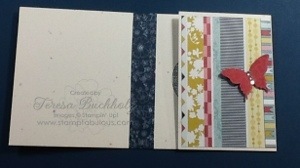 It is another fancy fold card. My friend Beverly Carlen, from Fort Mill, SC taught me this fold. Sale-a-Bration ends on March 22nd, for every $50 purchase you get one item free from the Sale-a-Bration Brochure! Don’t wait, order online now and be sure to add those Clearance items you’re wanting to your online order. Clearance items can only be purchased on line, and will count toward your total purchase!